New Jersey Republican Steve Lonegan’s political dog whistles are not very subtle. Following up on the insinuation that his fellow Senate candidate Cory Booker is kinda gay, the manly Lonegan will host an event today “in front of Cory Booker’s abandoned property, now a crack house.” The New York Post reported that the Newark place, which Booker bought in 2009 and sold recently for $1 to his own nonprofit, is overrun by “squatters in the yard, people using drugs,” according to neighbors. 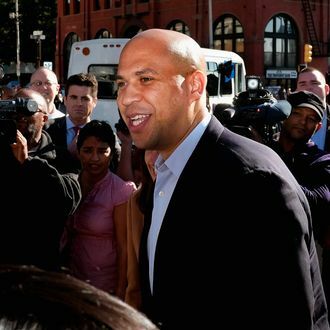 And yet the last Booker scandal — which has yet to dent his huge lead in the race — was that he didn’t know a drug dealer. Which is it, Cory Booker? Do you love drug dealers or not? The people need to know.